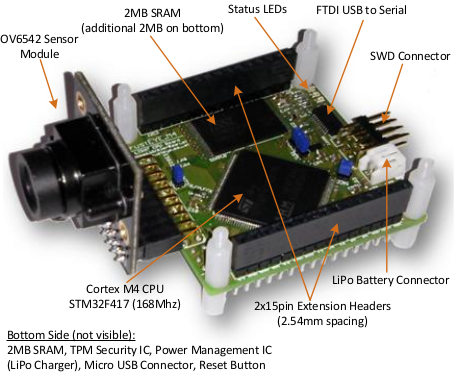 The TrustEYE.M4 system is a Visual Sensor Network (VSN) Prototype developed in the TrustEYE project. It is designed as a dual-use system which supports deployment in standalone mode as well as usage as a sensing module in a larger embedded smart camera. The TrustEYE.M4 CPU board is based on a STM32F417 Cortex M4 system on chip (SoC) clocked at 168Mhz with 192kB on-chip SRAM and 1MB program Flash. On the 50x50mm two layer printed circuit board there are additional 4MB of SRAM (2 banks), a ST33TPM12SPI security IC, a BQ24074 power management unit and an FT230xs serial to USB converter. The system can be programmed, debugged and powered via Micro-USB. Optional power supply is realized via a single-cell LiPo battery. Two 15pin headers are available for extension boards. The image sensor can also be easily exchanged. The system is based on a custom-designed circuit board. Software libraries and tools have been designed and developed in-house. The platform is designed primarily for research and education purposed. We would like to encourage interested researchers to contact us to get access to the platform.